This mother-daughter duoâ&#x20AC;&#x2122;s entrepreneurial endeavor sparks a beloved hobby into a flourishing business and a new career direction. Threading Services Waxing Eye Lash Extensions Spray Tanning Novalash Eyelash Extensions And more! See Marketplace AD on pg. 66 for COUPon! Gaye and Abigail’s mutual love of preserving food and southern traditions is quickly becoming a flourishing pickle business – Old Soul. FACEACADIANA.COM ACADIANA’s ONly wOMEN’s lIFEstylE MAgAzINE. Acadiana, it is just ‘Festival’. Coming up this weekend April 4-6th, is the 2nd Annual Scott Boudin Festival celebrating Scott as the ‘Boudin Capital of the World’. It is another outstanding opportunity to be social, have fun, and support another of our Acadiana cities. 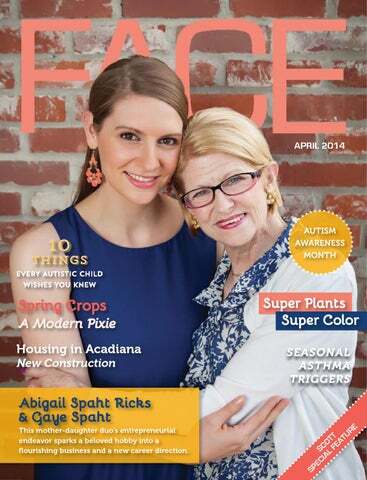 This month, FACE presents the second of many Community Spotlight features: Scott, Louisiana. You will learn not only about the Boudin Festival but also the history of Scott from the 1800s through the extensive economic growth and development that is occurring today. You will definitely want to visit! FACE cover story? Email me and tell me her story. Email must include: Event Name, Date and Location. Photos must have captions with names of everyone in each photo. CONTRIBUTING WRITERS Tim Borland • Jessica Conner Audrey Coots • Connor Day Keri Domingue • Lynley Jones Joslyn McCoy, PhD, BCBA-D Jan Swift • Flint Zerangue, Sr CONTRIBUTING PHOTOGRAPHERS Denny Culbert Moore Photography Philippe Motte PUBLISHER Flint Zerangue, Sr. info@faceacadiana.com FACE Magazine is a division of: The Zerangue Group, Inc. 102 Westmark Blvd. 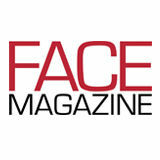 Suite 1B Lafayette, LA 70506 337-456-5537 On the Web www.FaceAcadiana.com FACE Magazine is published monthly and distributed free of charge to individuals and businesses throughout the Acadiana region. It is also available online at www.FACEACADIANA.com. No portion of this publication may be reproduced nor republished without written consent from the Publisher. Unsolicited material may not be returned. The owners, publishers, and editors shall not be responsible for loss or injury of any submitted manuscripts, promotional material, and/or art. The acceptance of advertising in FACE Magazine does not imply endorsement. FACE Magazine reserves the right, without giving specific reason, to refuse advertising if copy does not conform to editorial policies and/or standards. FACE Magazine does not necessarily agree with nor condone the opinions, beliefs, or expressions of our writers and advertisers. © 2014 FACE Magazine/Zerangue Group, Inc. All Rights Reserved. FACE | COMMUNITY MATTERS: History Scott has always existed as part of a transportation hub. When the city was founded, Drozin Boudreaux and Dominique Cayret negotiated a deal with J. B. Scott to have a train line run its tracks through the property in exchange for 150 feet of land and the construction of a train depot and station. Thus, the town was christened Scott in honor of J. B. The station was dubbed the “origin of western travel,” and different rates were charged for those traveling east or west. As part of the arrangement, patrons would be required to stop in Scott and pay a fee in order to continue west into Texas. As a result, Scott grew significantly due to the increase in commerce. As an important train stop, a variety of produce was shipped through the region, benefitting the farming community. Yams, cotton, and other products were among the main crops. Scott was well known as a central location for commerce and business by 1880. By 1896, the large square surrounding Scott Station included a large hotel, boarding house, blacksmith shop, three large mercantile stores, several residential homes, a sugar mill for producing molasses, two school houses, two taverns, a small cemetery, five steam powered cotton gins, and a warehouse. 200 people lived around the station and served population five times that number. Albert Bourque, who opened a saloon in 1902 that is still standing today, as Gallery Acadie, is attributed to coining the city motto “… this is where the west begins.” 200 people lived in the area around the station, but the city served a commuting population five times that size. The primary mode of transportation for most people were horse and mule drawn buggies. The home of Scott’s first doctor, built in 1907, still stands on St. Mary’s Street as Bijou Salon and Spa. Dr. Louis A. Prejean was a hearth and buggy doctor, making house visits for miles around in a mule drawn carriage alongside his driver. Dr. Prejean was instrumental in helping form Scott’s first bank, and served as the city’s first mayor. The first bank of Scott was founded in 1911, located next to the feed store and farmer loading dock. In modern times, native Paul Begnaud has converted the bank into a home. A clever part of the house design is that original bank vault has been converted into a kitchen. Much of this fascinating information is gleaned from a publication put together by multiple occupants of the city this year, entitled “Images of Scott.” Published last year through the Scott Historical and Genealogical Society, denizen Claudette LeBlanc was a major contributor to the work. She happens to be the granddaughter of Dr. Prejean, cousin to Mr. Begnaud, and daughter of the tenth mayor of Scott. Other townspeople like Riddell Miller have collected old newspaper clippings for years in order to preserve the city’s history. She fell into the habit thanks to her mentor, a schoolteacher from Riddell’s youth who saved every article about Scott in a shoebox for posterity. “My passion is heritage and culture because I am an Acadian Cajun. I speak the language, and I dance. I have been in tourism for almost 18 years,” Miller says. Although the original Sabine train line is not in operation and the station no longer exists, trains continue to pass through Scott heading west. While the era of train transportation has waned, Scott remains a transportation hub. The recently constructed roundabout at I-10 has positioned Scott to become a major growth area once again. With such rich history, it is no surprise that many Acadians frequent the city. Economic Development Scott is currently poised to begin major growth. There are numerous exciting plans for the city. Scott currently ranks as the second best place |to live in Louisiana, and many upcoming ventures will further enhance the community. “Council members and the mayor put the city and their constituents ahead of any personal agendas. Past and present leaders have aligned projects and recruited businesses to the area to maximize growth at minimal cost to residents, through grants and other state projects,” Scott Fire Chief Chad Sonnier informs. At the age 53, Mayor Purvis J. Morrison has never moved from the City of Scott. Prior to serving his first term as mayor, Morrison served the community as a councilman for four years, and a city parish councilman for three years. In addition, the city council contributes major support of all the economic developments in Scott. Council members pass laws that affect sewage, water rates, roads, and the city in general. The council helps develop a comprehensive plan for future sustained and planned growth. In addition, council is part of a twinning committee teamed with France and Canada for the preservation of French culture. “We try to make the right decision for the majority of the community, not just one or two,” Bill Young, eldest councilman of five years and owner of local business First Turn, confides. The mayor is currently working with the Lafayette Metropolitan Planning Organization with the purpose of obtaining and implementing traffic roundabout feasibility studies for a number of locations in Scott. Comprehensive Plan Facilitator Pat Logan, who retired from the Lafayette Consolidated Government after 33 years of experience and 14 years as Associate Director of Public Works, will be the mayor’s appointee to the Transportation Technical Committee for the MPO. “We are currently working on creating a land use code to manage future development … the TTC is an integral part of the planning process relative to the allocation of State and Federal for the area,” Logan informs. One of the most promising prospects is referred to as Destination Point, which is the northwest corridor of the I-10 ramp. The location consists of over 40 acres and has been considered for economic development for over 10 years. There is potential for major retailers to build businesses in the location, and the city has applied for grants totaling approximately $2 million for the development. Water and sewer is being added and roads are being designed, with bids to be made in the coming months. Another growth opportunity is the Apollo Road Extension, a main vein adjoining I-10. The two-mile stretch of land runs parallel to Ambassador Caffery Parkway, and will be transformed into a 4-lane boulevard from Cameron Street to Dulles Drive. The proposed boulevard will set the tone for the neighborhood with streetlights, a walking path, and a bike path. It will also provide access to the southern part of the parish. The impact on traffic will be positive as well, as estimates suggest up to 20,000 cars the first day it opens. A monument sign will be constructed on the road so that Scott will be seen as more of a tourism site. Architecture students from the University of Louisiana Lafayette are helping with the designs of the development. The city has applied for $15 million in grants for this project. “I think that has been an untapped area, so to speak. We would like to develop those spaces,” Jan-Scott Richard, Mayor Pro Temp and owner of Cajan’s Eatery, states. Family-Owned and Locally Operated Specialty Meat Department - Fresh Meats Specialty Bakery, Deli and Floral shop Home of the Original “Darby’s Sausage” Clean and Friendly Atmosphere Located in the Heart of the Boudin Capital Many other projects are already underway. A new farmers market held on Saturdays recently began. Produce cannot be commercially bought; instead, it must be grown or manufactured. This distinction makes the event a true farmers market, as opposed to a flea market. Last year’s first annual Scott Boudin Festival was a huge success, with an estimated 30,000 people in attendance. Scott restaurants and vendors sold an estimated two million pounds of boudin last year alone. A volunteer base of over 100 people responded to every need of the city to make the event a success. “I do not think you will find more kind and generous people than the people of Scott. They make it a great place to live,” Mayor Morrison suggests. More businesses are becoming established in Scott, bringing more employment and permanent inhabitants. Scott Commercial Park is a 30-lot light industrial park that is now open for business. A groundbreaking was also held for National Oilwell Varco, which will be constructing two 20,000foot facilities. One building will be a fully operational company with 80 employees, while the other will function as a training facility. As a nationwide company, the training facility will bring many visitors supporting local hotels. There are even new subdivisions in Scott, one currently containing 150 homes. The other subdivision, currently in phase 1, contains 88 lots. More ideas for growth include additions to park and recreation areas for children. The city currently has a baseball field, and many people would like the city to purchase more property in order to add soccer fields as well. A new 4-H facility is a possible long-term goal. As a five- to six-year project, the Acadiana Agriculture and 4-H Center would provide a venue for livestock shows. District and regional shows currently occur in Lafayette. The state-of-theart, air-conditioned facility could function for a rodeo as well, bringing more commerce to the city. FACE | COMMUNITY MATTERS: “We are a growing community, but we always keep the people first. We are trying to retain our wonderful culture and our identity, and keep Scott where the west begins,” Mayor Morrison expresses. Boudin Capital of the World Any visit to Acadiana is not complete without a meal in the Boudin Capital of the World. The distinction is due to Scott having the most boudin purveyors per-capita in the state. This Cajun delicacy can be found in multiple restaurants and stores often served with cracklings. Scott is also home to the Scott Boudin Festival, which will return April 4 through 6. Most Acadians are aware that when the British expelled their French ancestors from Nova Scotia, they made their way to the bayous of Louisiana. The rustic new life required ingenuity and creativity to survive. When Acadians butchered a hog, they made a stuffed sausage called “boudin.” Along with pork skin cracklins, boudin enabled the townsfolk to utilize as much of the pig as possible. The slaughter itself was called a “boucherie,” and relatives would gather in order to split up the meat. Despite this common heritage, no two boudins are the same. Different varieties contain varying amounts of rice, meat, onions, garlic, salt, black pepper, red pepper and other signature spices chosen by the chef. The dish can be served numerous ways, from boudin links to boudin balls to boudin sandwiches. Some even disagree on the best method to eat the tasty sausage; a few prefer to split the casing open and eat the inside instead of devouring the links whole. There is even seafood boudin on Fridays for Catholics observing the Lenten season. their own unique way of serving it,” Kelly Potier, Scott Louisiana Boudin Festival Pageant Director, explains. As for the pageant, 11 kings and queens were named from over 100 hopefuls this March in anticipation of the upcoming boudin festival. The queen will have the honor of attending the Washington Mardi Gras ball in January of next year. Organizers expect that a queen will be eligible to compete as part of the Louisiana Association of Fairs and Festivals by 2016. Potier was chosen as pageant director due to her experience, having directed pageants for 17 years. “The pageant serves as a way to select ambassadors that will travel around Louisiana representing Scott,” Potier says. The Boudin Festival is a very affordable weekend jaunt for families. Admission on Friday is completely free, while Saturday and Sunday only cost $5 and there is no charge for children under the age of six. Whether a person enjoys food, music, social events, or independent vendors, the weekend will provide plenty of entertainment for guests. The festival is also an excuse to unite the tight knit community of Scott with a citywide celebration. “The Boudin Festival is very important to us because it allows all of us to come Don’s Specialty Meats, purveyors of Cajun cuisine, has become the most prominent boudin maker with sales volume of 785,000 pounds a year. Citizens in the region have voted Don’s the “best” for 7 years in a row. The independent business serves boudin hot and ready to eat every Friday during lent, and has daily plate lunches alongside a full service grill. The location also boasts the number one crackling sales volume in the state. Other products offered include stuffed pork chops, smoked sausage, and deboned chickens. together. There is something for everyone. It is a safe, friendly, family environment that everyone can attend,” Potier assures. To celebrate the popularity of boudin in the city, a non-profit organization was formed to plan the first annual Scott Boudin Festival last year, which was met with much success. Far more than just a collection of food stands, this full on festival event will include fair rides for children, arts and crafts vendors, appearances by the kings and queens of the second annual Scott Louisiana Boudin Festival Pageant that was held in March, a diaper derby for young children, musical performances by zydeco and swamp bands, and of course the obligatory boudin eating contest. “It is amazing to me. All these people on the board work together. We could not have the festival without our volunteers. That is really what makes the festival such a success,” Potier expresses. Volunteer Fire Department “We have a variety of members in our department. We have volunteers that are career firefighters, oil field workers, business owners, law enforcement officers, a physical therapist, and college students. No matter what their career may be, when the pager goes off, they are all firefighters,” Chief Chad Sonnier exclaims. Scott’s Volunteer Fire Department is in the top 10 percent of volunteer departments in the country. The 42 members of the department train hundreds of hours to prepare for that split second decision to save the life of a total stranger. And unlike a career department, Scott’s team of firefighters does not receive a salary or benefits for their services. Volunteer departments are held to the same standards as career departments. They must meet all the requirements of the National Fire Protection Association and Property Insurance Association of Louisiana, which dictate insurance premiums. Volunteer departments must obtain their required training hours after they complete their full time job. Both career and volunteer firefighters face the exact same type of dangers and emergencies. “I do admit, being a volunteer firefighter places a strain on your family life; no one knows when the pager will go off and husbands or wives are forced to leave, to help someone they have never met,” Sonnier relates. The department is currently housed in a modern fire emergency building constructed by the city only five years ago. When not risking their lives, the department assists with fire prevention and fire safety during public gatherings. Having a firefighter on hand can provide hidden benefits. During the first annual Boudin Festival in 2013, photographers were hoisted over 100 feet in the air, allowing them to capture all the festivities. “There were more people than anyone expected; for nearly two city square blocks, all you could see was people shoulder to shoulder. Most volunteer firefighters join to better their community. We do anything that will benefit or promote Scott,” Sonnier pledges. Eat, Drink, and Talk Loud... You're Among Friends! Arts and Entertainment Among the numerous benefits to living in Scott are the distractions present to break up a leisurely afternoon. Many community events draw the entire town; the city really is that place where everybody knows your name. Biking on the Block is a once a month gathering sponsored by the Cajun Harley Davidson, owned by Geoffrey Hebert, husband to Teresa of Bijou Salon and Spa. A gazebo is erected on the grounds, bands play, and bikers come from all around and have a block party. Another destination is the Lafayette KOA Campground located on Apollo Road, which is operated by the Ellamen family. The facility includes a lake and swimming pool and is popular among campers. The campground is a great selection for hosting family reunions, or simply to get the kids out of the house for a night or a weekend. Annually, the region also hosts a parade during the Mardi Gras season. As one of the daytime parades in Acadiana, Scott’s parade occurs on Sunday a week before Mardi Gras. Scott is even home to its own Mardi Gras organizations, such as the Krewe of Olympus, Krewe of Atlantis, Krewe of SBA or Small Business Association, and Krewe of Red Hot Scott. FACE | COMMUNITY MATTERS: result and has been encouraged in that field his entire life by his grandmother Vivian Domingue, age 95. Oleus and his partner Bryan Theriot decided to lease the building that Floyd utilized during the 1980s and 1990s and reopen it as Gallery Acadie. Interestingly, this same building is the location of the original saloon built by Albert Bourque. Oleus refers to Gallery Acadie as a working studio gallery. This means that an artist in residence actively works on his or her projects in the building, which is open to the public. Guests can come in and observe the artists as they work, revealing technique and approach in the process. “We wanted a place where we can display our art and people can walk in and see us painting,” Oleus emphasized. Oleus was responsible for creating Scott’s first annual Boudin Festival poster. The original creation consisted of a pig and a locomotive, representing two of the well-known features of Scott: boudin and the train station. For this year, Oleus focused on the city motto, which is “Where the West begins and the hospitality never ends.” Pictured is a table with Acadian flag as a table cloth with a plate of boudin and boudin balls. The perspective symbolizes an invitation to the viewer to come and sit down at the table and join the feast. “I wanted it to be cultural with the Acadian flag. I just wanted it to be inviting and hospitable. We want to focus on the culture of the town,” Oleus shares. Gallery Acadie is also the home of Brushes and Boudin. The painting party is open to people of all skill levels for a small fee. Over the course of two hours, guests will work on a piece of art with advice and instruction provided by Oleus himself. Cajun music will be playing along with complimentary boudin and cracklins samples from Scott restaurants. Guests can bring their own wine to enjoy while they work. At the end of the evening, attendees will have a piece of art they are proud enough frame and hang on a wall. “If someone wants to take it seriously, we can instruct him or her. If they just want to have fun, we can help with that too,” Oleus suggests. John D. Perret is affectionately dubbed the monkey man. What at first may seem like an insult is actually a reference to the subjects in his artwork. John’s specialty is painting variations of the three wise monkeys, or as people know them “hear no evil, see no evil, speak no evil.” The artist plans to have his gallery 3 Wize Monkeez up and running by this spring. The three centrally located art galleries may use the buildings close proximity to each other to their advantage by promoting an art walk during the new Saturday farmers’ market. The market occurs across the street from the venues, making it an easy stroll for guests. Additionally, tents may be added to the market in order to promote the art. A real blacksmith will be on hand during the market and art walk, producing live blacksmithing for the crowd. Scott is also home to a number of talented musicians. Lil Nate and Zydeco Big Timers, Travis Matte and the Kingpins, Keith Frank and the Soileau Zydeco Band, and Kevin Naquin The Ossun Playboys will all be performing at this year’s Boudin Festival. Another popular community social opportunity is the Friday night jam session. The informal get together is hosted by councilman Bill Young and consists of a collection Cajun musicians who meet at La Maison de Begnaud, or the Begnaud House. volunteer organization Action Cadienne to celebrate the French language, and celebrate the Cajun culture of Louisiana. He developed his chops by learning accordion from the late Felix Richard. For the bibliophiles out there, Dr. William Arceneaux is a famous Scott author. Originally raised in the city, William went on to become a professor at LSU. His book entitled “No Spark of Malice” relates the true story of an 1886 murder that occurred at Scott Station. Two young French immigrants living and working on a nearby farm named Ernest and Alexis Blanc murdered Martin Begnaud opposite the Rexall Pharmacy. The boys were found guilty of the murder and hanged for their crimes April 2, 1897. Due to the story, William is well known in France and frequently travels all over world to recount the story. During Scott’s centennial celebration in 2007, resident Riddell Miller helped direct a dramatic play based on the same story. According to Acadian legend, people came from as far as New Orleans just to witness the trial. The rich art community in Scott contributes greatly to the indigenous culture while providing many different services to the public. One can only hope that these developments will continue to grow, becoming even greater assets to the community. Tree of Soles Acadian Bed and Breakfast is an independently run Scott business that is notable for its cultural influences. Judy Sonnier and her husband built the structure themselves over the course of ten years with a sawmill and lumber from cypress trees. The structure is painstakingly modeled after traditional Acadian house structures. to the collection and offer a prayer to God. The shoes are a reference to how Jesus cleansed the feet of others, and by placing one’s shoes on the tree they can symbolically cleanse their soul. The Sonnier family’s strong Catholic beliefs have helped shape their outlook on life. “We built it in an Acadian style so people that came to Louisiana could really experience Acadian culture,“ Judy informs. “You throw your shoes up into the tree to lighten the burden of your soul,” Judy says. The Sonnier family took measurements for dimensions from Acadian Village in Lafayette. The location they chose near their family home on their own property because it was the site of one of the original homes on the plantation. The only work that was contracted out was the brick laying, plumbing, electrical, and sewer system. When the original tree was knocked down by hurricane Lily, two priests visiting the bed and breakfast encouraged the family to keep the idea going. Three replacement trees were chosen, in reference to the three crosses at Jesus’ Crucifixion. The trees have been featured in several publications throughout the southeast, drawing curious onlookers from multiple states. One man buried his parrot in his boot under the tree when it died after 30 years as a pet. A woman from Washington, La. wanted to make a prayer at the trees but could not afford to part with her shoes, so she offered her socks instead. Two days later she called Judy to let her know all her problems had been resolved. “I think it gives people something to believe and is key to making that prayer be heard. Just having faith that you will solve a problem, and it will be solved,” Sonnier suggests. Ironically, the trees have not increased business at the bed and breakfast at all. People who come to see the trees do not necessarily spend the night. However, Judy seems nonplussed by all the unexpected visitors to her property. “Its not a business that makes money, it’s a business that makes friends, and you can’t buy friends, so that’s worth everything to me,” Judy emphasizes. “Festival is a celebration of our culture and the spirit of the people who call Lafayette home. The Festival celebrates our connection to the Francophone world and its influence on Acadiana,” Executive Director Missy Paschke-Wood conveys. Cultural events and organized family reunions will be held in the region known as the “Acadia of the Lands and Forests,” which includes the U.S. state Maine and Canadian provinces of New Brunswick and Quebec. The CMA 2014 is an invitation for all Acadians to come together to share and celebrate the Acadia of the world. Besides the great culture and music, there is plenty more to keep attendees occupied. From food, to arts and crafts, to theatrical performances, there is something for every person to enjoy. Many local businesses aid the cause, and are listed on the informative festival website, the festival pocket guide, and will be announced from stages during the festival itself. “We are extremely grateful to the many local businesses who partner with us and support the Festival. Presenting a Festival as big as ours is expensive. To remain free, we need help from everyone in the community,“ Missy and Apiyo express. © 2014 EWC You must be a state resident. There will be a wide mix of ages and ethnicities present during the weeklong celebration. The organizers strive for 80 percent of the programming to be Francophone, which means many representations of the Cajun and Zydeco musical traditions. Guests often dance along to the musicians’ performances. Saddle Up for Hippotherapy	By Audrey Coots Horseback riding is known to many as a fun, enjoyable hobby. But did you know that it can also be used as a form of therapy? Hippotherapy is a type of therapy that utilizes a horse’s movements to improve the lives of those receiving this particular type of therapy. The natural gate of the horse is ideal for aiding in the rider’s balance, core strength and posture, but those are not the only benefits. “Benefits and changes seen in the clients following the sessions are wide ranging and include reduction in spasticity muscle tone, resulting in greater range of motion and ease of movement,” says Lorain Gilbert-Fontana, PT, MHS. “In clients with low tone, one can see an improvement in posture and strength of core muscle groups. Other benefits include improvement in endurance, strength and self esteem.” Jennifer Schmuck can certainly attest to that. “I’ve noticed a big improvement in Patrick’s fine and gross motor skills,” Jennifer Schmuck says of her 8-year-old son, who has participated in hippotherapy for over four years. He has a high functioning autism spectrum disorder, and Jennifer believes that his time spent receiving hippotherapy helps him to become more focused and relaxed. “One day just before going to his horseback riding session, I noticed that he was just having a bad day and not communicating well at all. I couldn’t get him to focus and listen, and I even warned the therapist ahead of time that he might not do well that evening. Oil Center Gardens | 1116 D Coolidge Blvd. | Lafayette, LA 70503 Like Us on Facebook! “Benefits and changes seen in the clients following the sessions are wide ranging and include reduction in spasticity muscle tone, resulting in greater range of motion and ease of movement. Other benefits include improvement in endurance, strength, and self esteem.” so wonderful to see. She now also competes in the Acadiana Area Special Olympics Equestrian Event for Vermilion Parish every year. She is much more open to trying new things and I find that she uses her hands much more than she once did. Her sensory issues have lessened. Her gait (walking) is much steadier.” This therapy has benefitted the families of those involved, as well. Jennifer Schmuck recommended hippotherapy to her sister, who has mild cerebral palsy, and in the 2 ½ years since, she has seen a remarkable difference in her sister’s balance, strength, and confidence. Janice believes that this therapy carries over into every aspect of her daughter’s life, and that the results have enhanced the lives of her entire family. “Whenever I meet a parent with a child that is having different types of issues in my community, I generally end up telling them of our positive experience with this type of therapy,” she says. “Just as other activities were used as life lessons or teaching moments for my other children, this is part of Tessa’s life lessons. I am not trying to ‘fix’ her. We enjoy our time together and we have met so many dedicated people from all walks of life.” Hippotherapy is a combined effort, and the success of each individual case is dependent on the patient, the horse, and the therapists and volunteers. If you would like to learn more about this type of program, please contact Physical Therapy Works at (337) 988-4444.
the overall balance and proportion, you create a more youthful, more rested appearance that still looks like you–only better. The hands of a surgeon. The eye of an artist. Fundraising does not end with Race for the Cure. Komen Acadiana continues to raise funds through April 15, 2014 to provide grant awards to local programs. This year 11 grants were submitted totaling more than $600,000. It is not too late to Raise for the Cure. The easiest way to Raise is by taking the Power of 10 Challenge. Simply ask 10 people for $10. That $100 could pay for a lifesaving mammogram or provide transportation assistance to someone undergoing treatment. For every $100 raised you will be invited to a VIPink Party presented by Cypress Bayou Casino & Hotel. Thanks to the generosity of communities like Acadiana we are making strides every day in the fight against breast cancer Susan G. Komen’s vision remains, a world without breast cancer. It will happen one day, how quickly, is up to you. Aveda Earth Month raises funds and awareness for environmental projects around the world. Since 1999, the Aveda network has raised more than $32 million to help support organizations that directly affect environmental change; $26 million of this amount has been earmarked for water-related causes. On Sunday, April 27th, Aveda Institute Lafayette celebrates Earth Month with the Catwalk for Water fundraiser benefitting The Lower Mississippi River Keeper and The Gulf Restoration Network. Enjoy an evening of exciting hair, makeup and fashion constructed from recycled material, all designed by Aveda Institute Lafayette students, to reach the goal of raising $13,000 to help the fight for clean water. Work created by prospective students will be featured and a grand prize full scholarship to Aveda Institute Lafayette will be awarded. For more information on the event, please contact 337-347-7386. For scholarship opportunities, please visit AIsouth.com/contest. 10 Things Every Child with Autism Wishes You Knew It has been wisely said that if you meet one child with autism, you have met one child with autism. I have worked with many children with autism over the last 10+ years and this cannot be more true. There are however, a core cluster of behavioral symptoms that comprise Autism Spectrum Disorder (ASD). Behavioral symptoms include impairments in social/communication behaviors and restricted, repetitive patterns of behavior, interests, or activities. Social and communication impairments may include difficulty with the giveand-take common to social interactions, decreased initiation or response to social interactions, and reduced ability to share interests and emotions with other people. Poor use of eye contact, facial expressions, and gestures may also be present. Lack of development of peer relationships, delayed imaginative or pretend play, and difficulty changing behavior to suit various social contexts are other areas of impaired social/communication skills. Restricted, repetitive patterns of behavior, interests, or activities include repetitive behaviors such as lining of objects and echolalia (repeating words or phrases exactly as they were heard), need for sameness, intense interests to the exclusion of other interests, and sensory sensitivities. It is important to be aware that this is a spectrum disorder and each child is at a different place on the spectrum and that place may change across time. #2: My sensory perceptions are disordered. Imagine wearing a wool suit against bare skin all day or common sounds being perceived as nails scraping a chalkboard. Alternatively, imagine having a constant state of arousal similar to how you feel as you are drifting off to sleep. This is the experience for many children with autism. Sensory sensitivities may affect a child with autism’s sense of taste, touch, sound, smell, and sight. Some children find certain sensory information as aversive, just as we would a wool suit. We would certainly attempt to remove the suit or re-position it in such a way that we do not feel it. Children with ASD also try to avoid aversive sensory information. Removing shoes, covering ears, or turning off lights are some ways children may attempt to lessen the harshness of sensory information. Other children seek out sensory input; similar to if we were half-asleep and trying to remain alert. We often stand up, walk around, or try some other means to arouse ourselves. For children with ASD, this may look like jumping, spinning, or running. Occupational therapists are extremely effective in helping children with ASD to regulate their sensory systems which in turn helps the children to find comfort in an otherwise chaotic sensation-filled world. Multiple parents of children with ASD have recommended to me the book Ten Things Every Child with Autism Wishes You Knew by Ellen Notbohm, author and parent of child with ASD. This book has long been part of my library and is one I now commonly recommend to parents of children with a recent diagnosis of ASD. In an effort to increase awareness and acceptance of our community members with ASD during Autism Awareness Month, I have chosen to offer a brief summary of the valuable information contained in this book. If you are a parent, teacher, friend, or neighbor of an individual with ASD, I encourage you to read this book as it offers an account of the experience of ASD from the most important perspective: the child. #1: I am first and foremost a child. Many parents and professionals express a behavioral concern and follow with: “Is that behavior because he has autism?” or “It is hard to know where autism ends and the little boy begins.” Parents and professionals are often simply trying to identify the reason for a behavior or to set a realistic expectation for the child. However, autism is only one small part of the child. It does not entirely define the child. It does not place clear or definitive limits on his potential at the time a diagnosis is made. It is of the utmost importance that we have similar expectations of children with autism as we do for children who follow a typical developmental trajectory while providing appropriate support as they work to reach that expectation. Otherwise, we may set the bar too low and the children abide by the limits we have placed on them. a skill-deficit (can’t)?” If it is a performance-deficit and the child has the ability to complete the task we have presented, then we must offer the proper motivation to encourage compliance. If we determine it is a skill-deficit, then we must provide the necessary teaching and guidance to help the child to complete the task. By addressing these two questions, we reduce the frustration of both parties. #4: I am a concrete thinker. I interpret language literally. We must be constantly aware of the language we use when speaking to children with ASD. Clichés, inferences, and indirect instructions are often lost on those with language impairments. It is best that we use succinct phrases when speaking. It takes effort and practice to adopt this strategy but it comes with great reward. #5: Be patient with my limited vocabulary. Some children with ASD have learned that it is socially acceptable to respond when spoken to. They have learned the art of turn-taking. However, when the verbal exchange becomes too complex, their response will likely reflect their limited vocabulary. We may observe repetition of the last words we said or a “scripted response” which may be appropriate in context but is taken from a television show, movie, or song. Some children speak a great deal but the content is shallow. They are unable to build upon our statements or elaborate on their own statements. The attempts to compensate for limited vocabulary may leave us feeling confused thus requiring patience on our part as we remember that this is a skill-deficit that will require ongoing support. are unable to generate an alternate, more appropriate response. For other children with ASD, the social world may be so unpredictable and confusing that social interactions are believed to be too troublesome and not worth the effort. And yet for others, we have to convince them that having social partners is rewarding. Regardless of where your child with ASD is in his social development, it is highly likely that direct instruction, ample encouragement, and patience will be needed to help him navigate social interactions with others, especially those outside of the family. Dr. Joslyn M. McCoy is a Licensed Clinical (Child & Adolescent) Psychologist and Board Certified Behavior Analyst specializing in the evaluation and treatment of a variety of learning, mood, behavioral, and developmental concerns. Dr. McCoy currently practices at Family Behavioral Health Center in Lafayette. Dr. McCoy also volunteers as a member of the Autism Society Acadiana Advisory Board. A Crucial Piece of the Puzzle for Many Acadiana Families	April is National Autism Awareness Month. Autism, or Autism Spectrum Disorder (ASD), is defined as a range of complex neurodevelopmental disorders that express themselves through a variety of social, behavioral, and communication difficulties. Because Autism is considered a spectrum disorder, no two children diagnosed are alike. Autism affects 1 in 88 children in the United States with boys being four times more likely to have ASD than girls. We are fortunate to have a great organization here in Acadiana that dedicates itself to supporting and educating the community about Autism in our society. The Autism Society of Acadiana aims to support any medical professional, teacher, family member, or parent that has a connection to the autism community, be it a patient, student, friend, or child. They are a non-profit organization that prides itself in making a difference, and a connection, to those in our community who are affected by ASD. The Autism Society of Acadiana has helped many families in Acadiana through the wide variety of programs they offer, as well as their vast support network of fellow families, teachers and doctors. The programs offered by the Autism Society range from Autism friendly seasonal gatherings and movie days, to educational stipends and mini-grants for educators. These services, and more, have helped many of the families in Acadiana, some of whom were kind enough to share their stories with FACE. Serving Blizzards and Burgers, Cakes , Orange Julius & More! One of the first actions the Autism Society takes with a new member is giving them a “New to Autism” binder, which helps educate the parents and fellow family members on what Autism is and ways to help. The mini-grant program supports educators who assist individuals with Autism in their classrooms and schools with new and creative applications. No individual application can receive more than $1000 in funding. The mini-grant program opens each fall. Kid Friendly Kuts is a new program offered to help individuals with ASD tolerate haircuts. The salon is open only to those who preregister each time the service is offered (usually on Sundays). Discover the Fountain of Youth • Revitalize Your Skin • Refine Your Look • Rejuvenate Your Body with Professional, Experienced Plastic Surgeons Darrell L. Henderson, M.D. & Jeffrey S. Williams, D.O. Serving Acadiana for 40 Years Replaces lost collagen, giving you a naturallooking appearance, without giving you away Instantly smoothes out wrinkles Discover the proven results that 11 million women and men have experienced Darrell L. Henderson, M.D. & Jeffrey S. Williams, D.O. The Gill-Moore Family Carolyn Gill-Moore is a super-mom who has been active in the Autism Society for the last three years. She is the mother of two daughters, both of whom are on the Autism spectrum. She calls the Autism Society a “rock for her family,” stating “They [Autism Society] have gone above and beyond the call of duty for our family and have really raised the bar of what a special needs organization does for families.” Carolyn and her daughters especially enjoy the monthly Family Friendly Films hosted by the Autism Society, where families can go to watch movies in a more relaxed and welcoming environment. Family Friendly Films are offered each month at The Grand 16 - Lafayette for families to watch a movie in a relaxed and welcoming atmosphere. The lights are turned up a bit and the sound is turned down. Movies are G or PG-rated. The admission fee is the regular matinee price. Snacks may be brought in due to restricted diets and the concession stand is open. Volunteers are on hand as needed. your children’s displays of genius and talent, but they’re really not. your job skills and work while you are present at work! all in how you are perceived. • Be knowledgeable and up-to-date about the service or skill you are offering. Notes for tips on avoiding some of the top no-no’s in office behavior. • Show enthusiasm and be a team player. • Exude confidence. Not arrogance, confidence. “What did ______ (the person being gossiped about) say?” You know the gossiper hasn’t asked the victim of the gossip about her side of the story, and this gentle time-out also reminds everyone around you that there is a person being talked about who isn’t there to defend herself. Protecting others in this subtle way sends a clear signal that you are not interested in degrading one not present, or at any time for that matter, and you will earn the respect of your peers. attractive hairstyle and keep your nails simple and well groomed. Don’t let mishaps such as ratty shoes, clothing stains, buttons missing, ripped hems, tight clothes, gaudy jewelry or overpowering perfume diminish you and distract people from your abilities. • Spend time giving clear instructions and explanations to staff. maintaining correct posture, and by having a friendly attitude. Leave Crabby Patty at home. • Minimize delays in service so the customer remains satisfied. Confidence in the workplace will flow over into your personal life. By being aware of the power you have to control your own behavior (and reading Grace Notes to stay on top of the latest etiquette tips) you will find doors opening and opportunities flowing your way. Take care of yourself, be gentle and kind as you learn, and best wishes on whatever endeavors you pursue! 913 harding st | oil center | 337.234.7171 | www.melodisbellesandbeaus.com Shop online at our newly designed buying website. Seasons Change, So Do Asthma Triggers For asthmatics, the risk of symptoms can be linked to the seasons and changes in weather (BPT) - Across the country, 25 million Americans are living with asthma. As the winter months come to an end and spring makes its arrival, the change in seasons can be problematic for adults and children with asthma. It’s important for asthma patients to understand the triggers of each season to prepare for symptoms as the temperature changes. Asthma patients know the symptoms: coughing, wheezing, trouble breathing and tightness in the chest. The cause of these symptoms is inflammation, or swelling, of the large and small airways in the lungs. During an attack, the airways become narrower and tightened, making it hard to breathe and reducing the flow of oxygen to other parts of the body. During colder months, it’s important to know that seasonal asthma triggers exist both indoors and outdoors. Outdoor activities paired with cold temperatures can put adults and children with asthma at greater risk for asthma attacks. Staying inside can also be problematic because unexpected triggers like indoor dust, animal dander, mold and even wood-burning fireplaces can cause an asthmatic to experience uncomfortable or dangerous symptoms. In addition to environmental triggers, cold and flu viruses can be a serious problem for people with asthma. Asthmatics are not more likely to contract the flu virus, but because they may have swollen and sensitive airways in the lungs already, contracting the flu may cause further inflammation and trigger symptoms. Now Offering Home-School Classes Mon-Fri for Grades K-12. CALL FOR DETAILS ABOUT OUR FUN SUMMER CAMPS! With spring bringing warmer temperatures, asthmatics have new triggers to pay attention to. Allergens from flowers and trees and the change in temperature can trigger an attack in people with asthma. Asthma is a condition that requires attention year-round. Patients should be aware of their seasonal triggers. It’s important to maintain communication with doctors and keep on-track with asthma management plans from season to season. Being smart about asthma management includes working with your health care professional (HCP) to create an asthma action plan that can be adapted to the season. This potentially life-saving tool includes notes for what to look for during an attack, emergency contact information and proper treatment methods. To download an asthma action plan, visit www.GetSmartAboutAsthma.com. The Get Smart About Asthma website serves as an educational center for patients and caregivers to find important asthma-related information such as types, triggers and treatment plans. Asthma symptoms and severity varies from person to person. While some require treatment with a rescue inhaler for the quick onset of symptoms, others use a controller medication for daily asthma management, which can help prevent symptoms and reduce the use of a rescue inhaler. Knowing and implementing the method for treating asthma symptoms is something every person with asthma should be familiar. Call for more specials. Limited time only. Some restrictions may apply. Voted Best in Blinds & Window Treatments! It’s a food town. Everybody loves to eat, everybody cares about the origin of their food and who’s making it, and they like to hear that story and meet the person who creates something they really enjoy. “I might have a jar of pickles in my trunk. You want me to get it?” Abigail interjects mid chat, her enthusiasm about the jarred goods she creates evidenced by her inquiry. Abigail’s passion for food was fostered heavily by her mother, who signed her up for cooking classes at an early age. The fermenting process expressly piqued her interest, and she soon began experimenting with pepper jellies and sauces. Her infatuation with food is strong, but her love of preservation is, by no means, confined to the kitchen. Abigail proportionately enjoys learning about the traditions that define a bygone era – a time when people relied on artisan skills to ensure their survival – and strives to keep these traditions alive by practicing them herself. She made her first quilt at the age of 12, and explains that she has always had different hobbies compared to most people her age. Not coincidentally, friends and family members began referring to Abigail as an old soul; and the nickname made absolute sense to Abigail and her mother when deciding on a name for their food business. In regards to who’s fonder of food, Gaye Spaht runs a close race with her daughter. She cannot recall a time when she didn’t love to cook. Gaye warmly reminisces about helping her own mother in the kitchen as well as the kick she would get out of her home economics class in high school. “As soon as I got married, my goal was to cook as well as my mother-in-law,” Gaye confides. Gaye’s first inclination has always been to nourish friends and family by whipping up dishes for them, ultimately showering them in affection in the form of food. And as mother and daughter, Gaye and Abigail quickly made a hobby out of hanging out in the kitchen together doing what they loved best. It wasn’t until their wild success entering an employee food fair together in 2010, however, that they decided to turn their labor of love into a more lucrative enterprise. “We thought, ‘Wouldn’t it be great to have a business together?’ And that day we said, ‘Maybe we really could,’ and that is literally where it birthed,” Gaye reflects, doting on the idyllic notion. This is definitely a dream come true and for me to be able to work with my daughter is absolutely amazing and wonderful. If you want to start a business and are currently doing something else, learn from where you are and make the most of your time. Starting a business is not for the faint of heart, but itâ&#x20AC;&#x2122;s really rewarding. “This is definitely a dream come true and for me to be able to work with my daughter is absolutely amazing and wonderful. We were very compatible, always, and love so many of the same things. We complement each other, it seems,” Gaye affectionately reinforces. The duo’s age difference creates an interesting and exciting paradox that offers yet another complementary dimension Abigail at the LSU Food Business Incubator kitchen with husband Jordan. “ to their business relationship. He’s our unsung hero!” As Abigail enjoys newfound business success in her 20s, Gaye is experiencing a career renaissance after raising children and being out of the work force for some time. In addition to finding a healthy balance between work and personal life, a successful entrepreneur must also maintain balance within their business. This rings especially true for partnerships, and the pair ascribes much of their success to the fact that they complement one another as mother and daughter, but also as business partners. Old Soul is also actively seeking a local farmer to partner with, “Abigail is creative, I’m more in hopes of creating a win-win administrative. PR, marketing, design, Preparing to demo at Whole Foods relationship where they can and all of those things are natural to her. I’m happy to do the banking, sales purchase produce directly while tax, reporting revenue to the government, and all of those continuing their commitment to “keeping it local.” Old things. She’s strong where I’m not, which is great,” Soul products can be purchased online at OldSoulPickles. Gaye reveals. com, where a full product listing and tasty recipes, such as the “Old Mary,” are there for the taking. Those interested in Abigail affirms her mother’s message, asserting, “Find that purchasing Old Soul products in Lafayette free of shipping balance if you’re going to be in a partnership. Identify areas where you aren’t as strong, and find people who can help charges can now locate them at Champagne’s Market in the balance that.” Oil Center. Gaye is delighted at the direction Old Soul is heading, claiming, Some people might find it difficult to work with a family member, but Abigail assures that she and her mother are very close and make an unstoppable team. They don’t always agree on everything, but they have healthy boundaries and the ability to come to a compromise that makes sense for both of them when an issue arises. Super Plants for Super Color Photos courtesy of LSU AgCenter If there’s any one thing that makes a garden-lover stop and take notice of a landscape, plant, or garden, it’s vivid color. Louisiana Super Plants are all you need to satisfy your craving for lasting, care-free color throughout the long South Louisiana summer. The LSU Ag Center created the Louisiana Super Plant Program to identify outstanding plants that are worry-free, easy to grow, and delightful. Their research specialists have studied hundreds of varieties and cultivars. They have taken the guess-work out of shopping. In order to be a Louisiana Super Plant, a plant must be not only beautiful, but it must also be pest and disease resistant. It must also thrive throughout our long, hot, and humid summers, even when the fair weather gardener stays cool inside. Since 2011, Super Plants have been announced twice a year, every year. If you selected cool-season Super Plants last fall, your yard is already saturated in the vibrant colors of spring. Don’t forget to shop for color at Festival des Fleurs on April 12 and 13 in Blackham Coliseum! The largest warm-season Super Plant is the Shoal Creek Vitex. It can be shaped as a large shrub or a multi-trunked small tree. Its profuse lavender flowers bloom in May/June, and then again in August. Butterflies are attracted to its many 12-inch, fragrant flower spikes. Another large and colorful Super Plant is ‘Aphrodite’ Althea. If you provide it with water, it will reward you with giant rosy-red, singleruffled blooms, with magenta throats, from spring through midsummer. You’ll enjoy a giant jolt of color from a brand-new 2014 Spring Super Plant called ‘Luna’ Hibiscus. Given plenty of sun and water, this plant will provide dramatic 6-8 inch diameter flowers that come in red, rose, white, pink or pink swirl. Expect blooms to peak in late summer. Another brand new 2014 spring perennial Super Plant is a new butterfly bush called ‘Flutterby Tutti Fruitti Pink’ Buddleia. This compact, non-invasive, drought-tolerant perennial will continually draw butterflies and hummingbirds to their spikes of pinkish purple, until the first frost. Another perennial Super Plant is Bandana Lantana. Choose flowers of brilliant red, glistening gold, or various hues of pink. Butterflies and hummingbirds are attracted to these colorful 2 foot by 2 foot shrubs all summer and fall. There are plenty of colorful bedding Super Plants, too. Some of these won’t return every year (unless we have a very mild winter) but their blooming season is so long and constant that they are worth planting every spring. For large pinkish-lavender flowers that last from spring through fall, try Senorita Rosalita Cleome. It can take sun or shade, severe pruning, or neglect. Unlike most Cleomes it won’t set seed or produce spines. Butterflies and hummingbirds will definitely visit these beauties. ‘Butterfly’ Pentas attract various hummingbirds and butterflies as well as the Tersa Sphinx Moth. They are more compact and robust than most Pentas, and come in a variety of colors including bright red, deep pink, deep rose, andlight lavender. For non-stop color that defies oppressive heat and humidity look for ‘Serena’ Angelonia, ‘Baby Wing’ Begonia, and brand new Super Plant, ‘Kauai’ Torenia. All three offer profuse flowering throughout the long summers of South Louisiana. Color choices abound in all three. Finally, enjoy a deep burgundy blanket of color with the vibrant foliage of ‘Little Ruby’ Alternanthera. This summer Super Plant doesn’t need blooms to make its presence known in your garden. To help ensure availability, ask for “Louisiana Super Plants” when visiting your neighborhood garden center. Why spend your own time and money on plant varieties that won’t survive the rigors of a long South Louisiana summer? The research has been completed and the winners have been announced. Anyone looking for garden color will find it in abundance with Louisiana Super Plants. About the author: Stacy Lee is a Lafayette Parish Master Gardener, PlantFest Chair, and Lafayette Garden Club member. She’s also on the Advisory Boards of the Lafayette Farmers and Artisans Market at the Horse Farm and the Acadiana Master Naturalists. She’s a retired attorney, a mom, a pet lover, and a garden and nature-enthusiast. A hot trend in 2014 is to bring flea-market furniture back to life with painted patterns and details. “Refurbishing old furniture pieces is a popular - and easy - look to achieve,” says Nayak. “All you need is a little bit of paint and a lot of creativity.” New pre-cut, patterned painter’s tape makes this simple project much easier. FrogTape Shape Tape is available in three of the most on-trend patterns: chevron, wave and scallop. Before painting, simply apply the tape in the desired pattern on a hand-medown or thrift store find to create a custom piece for your home. Plus, since Shape Tape is treated with patented PaintBlock Technology, you’ll create super-sharp lines and help prevent paint bleed. White is a mainstay in home design. It’s timeless, classic and extremely versatile. In 2014, try pairing white with different textures, like natural wood. You’ll create a unique focal point while highlighting other warm features in the room, as well. “Another method is to create contrast with white. Use a single, bold accent color, like yellow, fuchsia or navy, to move your eye across the space,” Nayak recommends. By simply rethinking how to use white, your home will be a warm and inviting haven all year long. 90% of my business comes from referrals! to consider before buying, when it comes to buying a new For nearly 14 years, Louise has put customers ﬁrst. In return, her customers have done the same by referring friends, family and colleagues. Here are a few tips to help you make an informed decision about the location and/or area of your next home purchase. work as well as on weekends to see if you like the lifestyle of the area. flood-zones. Department’s website. •	Research local school performance scores if you have school age children. •	Ask your real estate agent about home values and resale statistics. that perfect location or area to live in. Coach Hud and his wife Tyla know a thing or two about titles. Naturally, they trust the experience of Andrus Boudreaux Complete Title for their real estate closing needs. You should too. Call us today. FACE | FEATURE In addition, your MLO will also be able to explain the many different mortgage loan programs that are available. “The old adage of needing 20% to put down on a house is no longer the case,” says Logan. “There are a variety of financing options for home buyers, some even providing 100% financing. Each program has its own set of regulations and borrower requirements. We are fortunate in Acadiana that in addition to conventional loans, FHA loans, and VA loans, we also have the ability to take advantage of Rural Development loans in many areas. By utilizing these programs, many buyers become homeowners without having to come to the closing table with a lot of money. Of course, you still need to have money available to cover some of the costs that are paid prior to closing, like appraisal, inspections, deposits, etc.,” states Box. comfortable with calling on that builder in the future. building process. Having a good team of professionals representing you such as title/closing attorneys, inspectors, mortgage lenders, etc. is very important. An experienced local real estate agent will help you find the right team to represent you and your best interests throughout the building and buying process. communication with your builder is a key component to how smooth your project will progress. Not all spec home builders are cut out for being custom home builders, so it’s important to do your homework. Some builders are much better salesmen than others and some are more “hands on” than others. It’s also wise to find out how many projects the builder is involved with and whether or not you and/or your agent will be dealing with the builder directly or his project manager once the project gets underway.” As a rule of thumb, it is also extremely important that you verify with the Secretary of State that your builder is licensed to do business in Louisiana as well as fully insured for both liability and workers comp. It’s because of the little extras like credit cards with unlimited cash back for me and dog treats at the branches for my pampered pooch — the perks just keep on coming. with you builder is also a common mistake. do so within the timeframe set forth in the purchase agreement. Buying or Selling, We’ve Got You Covered! 107 Coral Reef | $152,500 This 3 bed, 2 bath home has a kitchen to die for! It sits on a total of 1/2 acre in the country yet just minutes from the mall! It includes a workshop with running water and electricity. Several updates to interior and exterior doors! 1 year home warranty with a reasonable offer! A great location facing the pool. 2 bedrooms and the laundry room and fenced patio area on lower level; 2 bedrooms upstairs with a balcony. Quiet development on a dead end street. Seller will pay up to $450 toward a Home Warranty Program at closing. The team at Tuten Title continues to grow to better serve you and your clients for many years to come. Expanding our team adds the time, experience and commitment to accurate and friendly service you deserve. Choose our team for all your real estate closing needs and you’ll feel right at home. hairstylist about the features you would like to emphasize while keeping in mind the following points: Shorter pixie cuts tend to look great on women with heart-shaped faces. The shorter length draws attention to the eyes and balances the width at the cheekbones. Those with square faces may enjoy a softer, wispier version that utilizes an asymmetrical fringe to frame the face. Round faces are enhanced by crops that feature shorter lengths on the sides and longer lengths on top to add height. Oval faces are balanced and can wear any length pixie. Hair color is a powerful enhancement to both the face shape and haircut. Pixie cuts are versatile and allow for many variations, from solid color balances to bold, intense shades, or soft, dimensional colors. The benefit of shorter hair is the opportunity to change your hue while maintaining healthy, shiny locks. The modern pixie cut accentuates your personal beauty and amplifies your personality. Whether you inspire elegance like Robyn Wright or express a playful wit a la Jennifer Lawrence, you will no longer be hidden behind your hair! Bring attention to your favorite feature, such as a bold lip color to enhance your smile or a smoky eye application to add drama to your look. Accessorize with bold earrings or keep your look timeless with a classic set of pearls. Your options are limitless. Spring is here, ladies. Are you ready to liven up your spring crop? u’ll love o y s e ic r p t a s k t pic Of-the-momen BLUE-ICE DRESS! This dress is so fresh and feminine! You’ll love the floral details at the empire waist. (BPT) - Spring is finally here; time to transition to your warm-weather wardrobe updates. To help you stay on top of the trends for spring 2014, the experts have plenty of advice to share. Lynne Riding, who is the fashion coordinator at The Art Institute of Charleston, a branch of The Art Institute of Atlanta, and Dr. Courtney A. Hammonds, who has the same role at The Art Institute of AtlantaDecatur, a branch of The Art Institute of Atlanta, offer some pointers. Top Fashion Tips for Spring and Summer! Q: What are the top five trends for spring 2014? A: “Look for clean, simple lines,” says Riding. “You’ll also see pleats, sheers and lace, and prints - both floral and graphic.” Hammonds agrees that pleats, especially knife pleats, will be big this spring. “Graphic prints are a major trend, using written words embroidered or printed across ready-to-wear garments,” he adds. “We’ll also see accessories with metallic touches in gold and bronze this year.” Q: What are this spring’s top colors? A: Both experts agree that lilac and other pastels are the most important color story for spring. Greens, especially mint green, are also big. “Muted and sophisticated tones predominate, although brights are also seen, particularly when paired with metallic touches,” Hammonds says. one piece should everyone consider adding to her wardrobe to be on trend for spring? Put your best style forward this spring in a classic baby doll dress with tribal beading and metallic sandals by Billabong. Perfect for brunch by the pool on Saturday or church on Easter Sunday! Show your spirited style in this off the shoulder daisy dress paired with a boho inspired cuff, multilayered necklaces and a strappy chunky heel. A must have for your spring wardrobeâ&#x20AC;Ś perfectly versatile sleeveless, textured zip-back dress accessorized with neutral sunburst earrings, assorted bracelets and topaz ring. Complete the look with coral cross body or clutch bag and neutral, cork wedges with just a touch of metallic glitz. Feel comfy and unique in soft chartreuse, Âž sleeve or stunning orange linen dresses paired with one-of-a-kind cork high heels for stylish spring and summer outfits. Add a matching handbag or contrasting watercolor clutch to match your personal style. Silver-plated dragonfly and long, multi-colored necklaces and earrings by Uno de 50, handmade in Spain, exclusive at Elenaâ&#x20AC;&#x2122;s.
Kick up your heels this spring in gorgeous fringe boots by Liberty Black paired with flirty Big Star blue jean shorts and white lace-trimmed Stetson blouse. Finish the look with Kinder West turquoise rosary necklace. Festival time is quickly approaching! Be boho chic in this strapless Enchanted Dayz Billabong dress with printed gauze skirt and hand-woven, fringed cross-body bag. Pair with metallic strappy sandals and festive jewels or let this dress speak for itself! This coral Stone Melody dress with lace panel inserts by Billabong is a must have for all your spring appearances. Pair with sandals and jewels to complete your sweet and stylish look. Be forever festive in this paisley print tunic with lace trim, purple tank and seamless capri length leggings. Add a touch of Sass western hat and a pop of purple handbag with designer-style sandals and jewelry for the perfect festival chic outfit! Nautically nice in navy blue flowy top with back ruffle detailing and JAG jeans in slim white denim. Add polka dot clutch and matching designer-style sandals and necklace. Top it off with a fantastic feminine fedora. with purchase of any hair, facial or massage service 1308 St. Mary St. Scott, LA 337-412-6635 Offer valid for one customer. Not valid with any other offers. Coupon cannot be copied or duplicated. Offer expires June 30, 2014. Offer valid for one customer. Not valid with any other offers. Coupon cannot be copied or duplicated. Offer expires April 30, 2014. Offer valid for one customer. Excludes trailers and tack. Coupon cannot be copied or duplicated. Offer expires April 30, 2014. SHARE THE LOVE! Refer a friend and earn $5 Ask for details. Offer valid for 1 customer. Not valid with any other offers. Coupon cannot be copied or duplicated. Offer expires April 30, 2014.
any one regular priced item 3229 Ambassador Caffery Pwky 337-981-7946 Offer valid for one customer. Offer excludes gift cards, Pointe shoes and special order items. Coupon cannot be copied or duplicated. Offer expires April 30, 2014.
food purchase of $50 or more 5525 Cameron St. Scott, LA 337-232-9877 337-232-9840 Offer valid for one customer. Not valid with any other offers. Coupon cannot be copied or duplicated. Offer expires April 30, 2014.